A combination of sleeping bag, security blanket, and private club house, the DreamSack quickly becomes the favorite hangout of the burrowing dachshund. 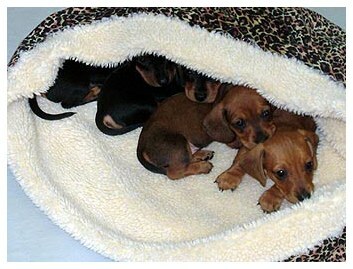 Dachshunds are natural burrowers - - and what better to burrow in than a shearling-lined sleeping bag? The interior is lined with soft, imitation sheepskin. 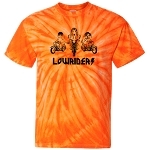 The exterior is covered with quilt-quality, durable cotton or cotton/poly fabric. Available in a variety of colors and patterns. 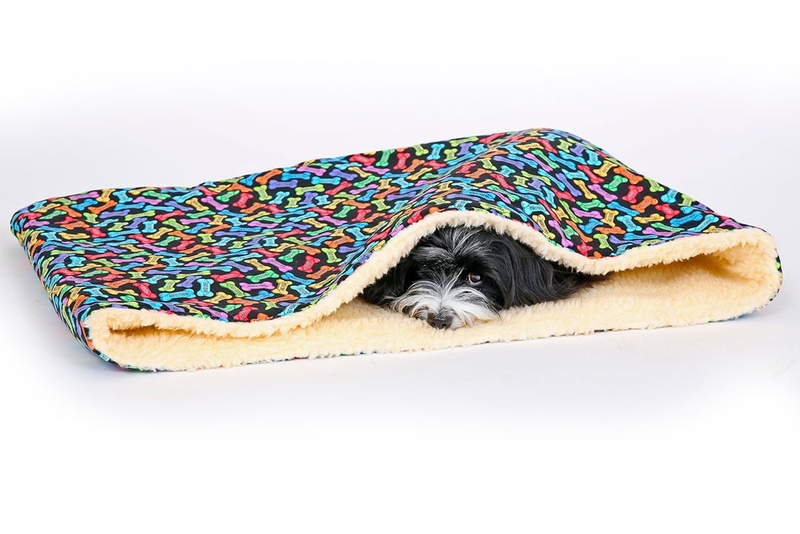 Just as with any item that a dog might burrow into -- sheets, blankets, pillow cases, sweatshirts, etc -- it's a rare possibility a dog (especially an older dog) may become disoriented while burrowing inside the DreamSack and may become stuck in one of the corners, causing breathing distress. 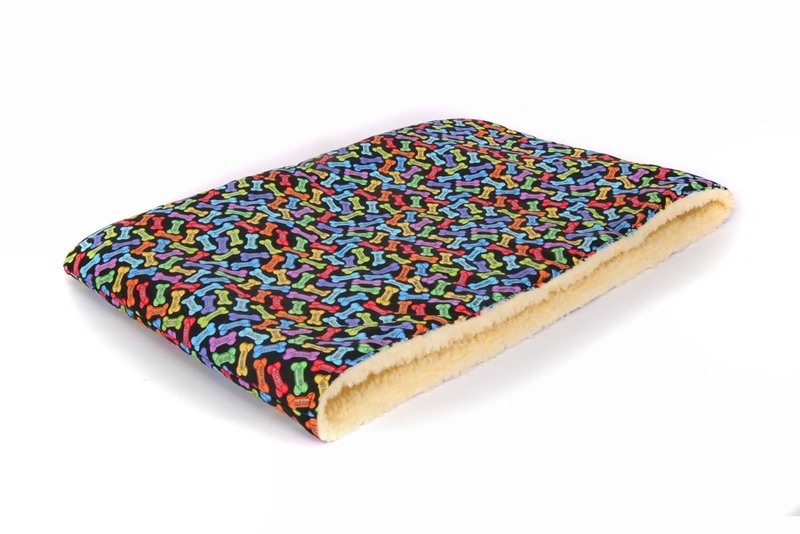 If you would prefer a bed with a looser cover, we recommend our Blanket Bed. All DreamSacks are custom-made. Please allow 2-3 weeks for delivery. Excellent purchase. Amazing quality. Is extra comfy cozy on bottom of the DreamSack. 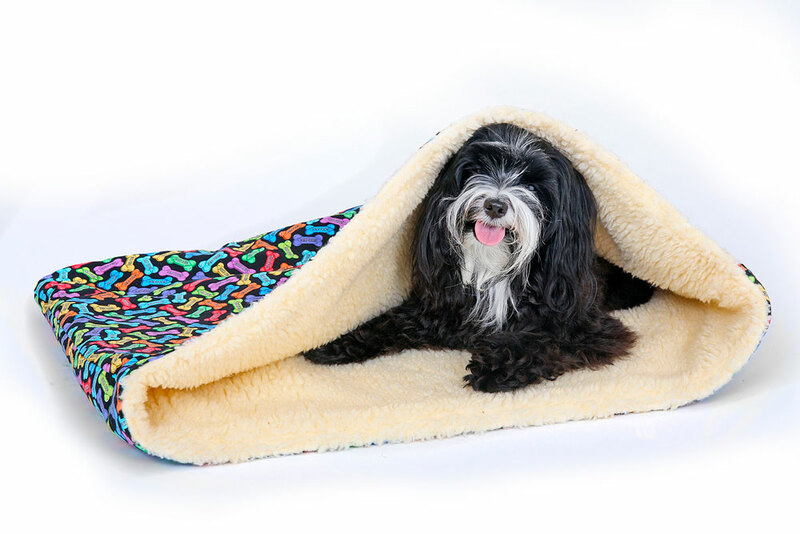 Mylie loves it & is her place to go for warmth and comfort! We just purchased our second Dreamsack for our now senior dachshunds (the first one is still in use after 7 years!!). They love to burrow inside it, and they also seem to think it's pretty comfy just to rest on top of it. I love the colorful material and pattern -- it makes me smile. 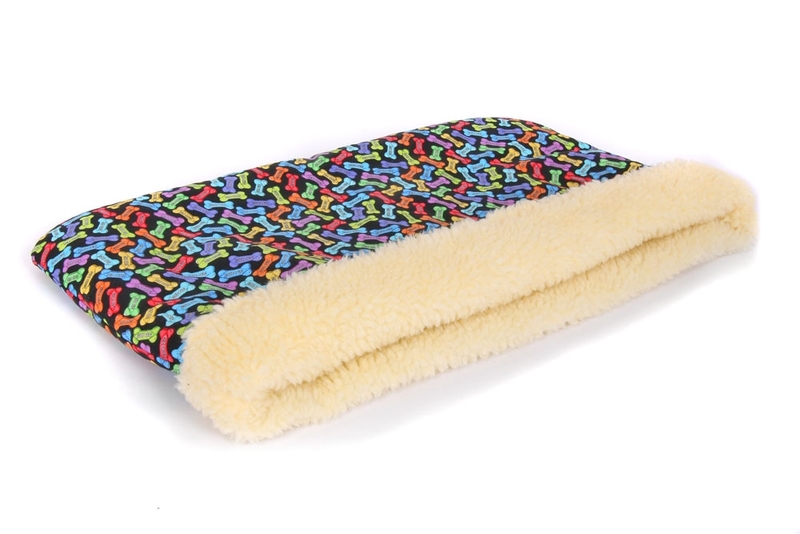 It is an excellent quality product, and my miniature dachshunds choose it above all other blankets and pillows! My miniature Doxie loved this from the minute I took it out of the package! He is currently curled up in his sack next to me on the sofa! I'm debating getting another one to keep at the office since he goes to work with me. Love it! I have just received my second Dream Sack for my Daschund - Wal - The first one is still going strong and he loves it, thought it time to give him a treat with a new one. The product is great and well made and does not take that long to get here to Australia. I am more than happy with this product. Thanks. Well made & very warm. If I curl back the upper edge (as shown in the pics), Mookie can get inside easily on his own. Otherwise I do have to help him. But even if I'm not around to assist, he curls up on top of his DreamSack. Beautiful patterns to choose from. Superb workmanship!!!! Very well made. My guys love it!! Dachshund Delights bed it simply the very best there is. They are perfect if you have a dog that likes to burrow. We have an electric heat mat in ours and so I got one size up from the smallest one. My old lady doxie spends most of the winter in that bed! Don't bother looking anywhere else; you will never find anything as nice and as high quality for this price. I would definitely buy again...actually this is my second one already!! Love this product. Very well made and so soft. Would definitely purchase another. I have purchased 2 Dreamsack's and 3 harnesses from Dachshund Delights in the last few months. I am delighted with the quality and the craftsmanship and will buy from this business without hesitation. My dachshund LOVES her sacks. She has three!! All over the house. 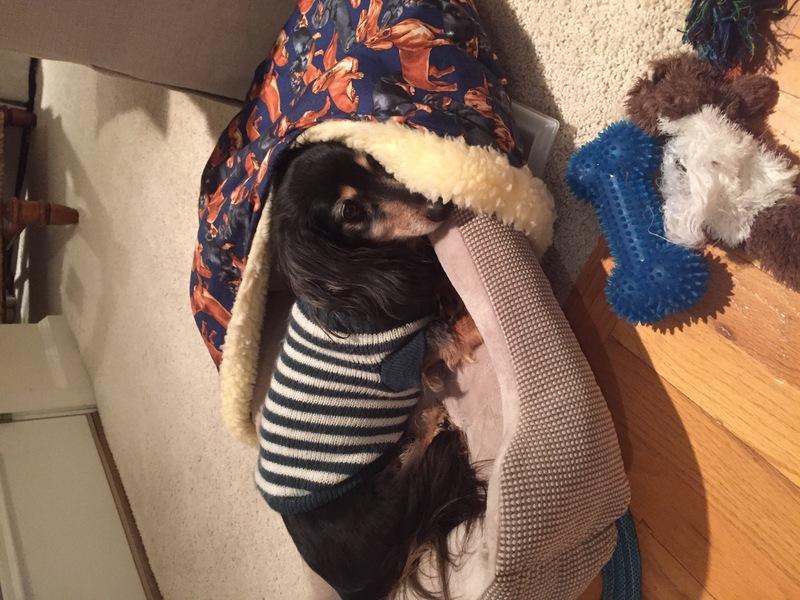 Our dachshund loves his DreamSack & so do we! The fabric is beautiful & it's so well made. It was finished quicker than expected too. 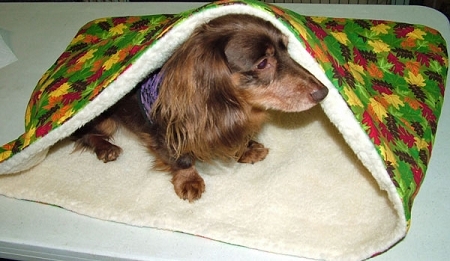 It is perfect size for our doxie to burrow in-thanks!! This is our second dream sack for our second pup. The first one lasted over ten years! Our pups love them and we take them everywhere with us. Right now my doxie is on my desk at work with his sack. Love them and will definitely be back for more! Thank you for a wonderful product! I bought dream sacks for both both my girls Lola, and Butterscotch. These have become their new favorite places. 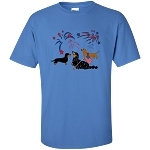 They can easily be moved from room to room and taken along when traveling with your dog. Great product! My dachshund Sarge loves his DreamSack - so warm and cozy. Perfect for him. I loved that I could pick the fabric! love it! At 13 y/o Klaus was not real willing to change his sleeping habits. When we put his soft side bed IN the DreamSack he loves it and that is what we stayed with. It’s very well made and I wish we found it years ago. 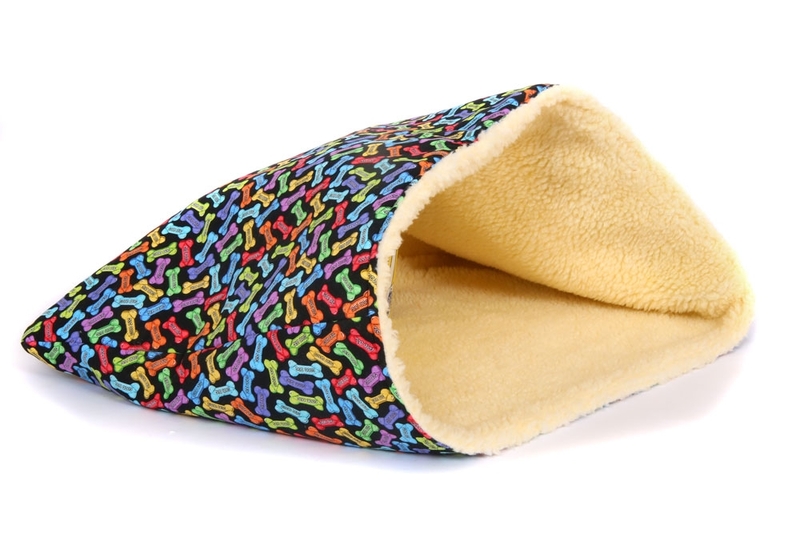 A great place to hide for a quick, warm nap, particularly during the winter months - great quality and nice design for my burrowing boy! My dachshund mostly enjoys sleeping on top of his Dream Sack and slips in between inside when he's especially chilly. This is his second Dream Sack. First one in leopard material became torn unfortunately, thus the 4 stars, yet we continue to launder and keep it handy for his snoozes.